Panaji: Figurines of the Bofors gun and Arjuna tank will adorn Defence Minister Manohar Parrikar's birthday cake on Tuesday, BJP MLA Michael Lobo said on Monday. 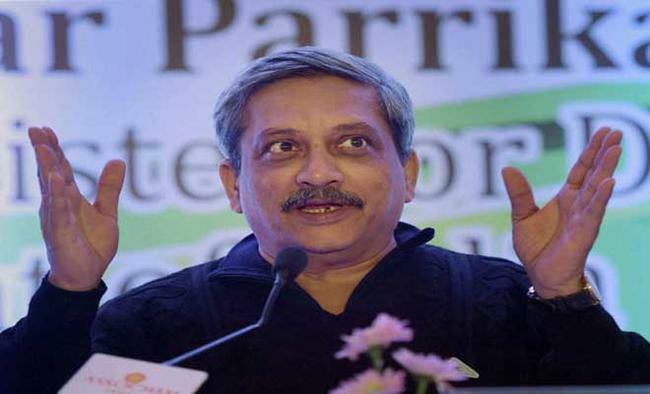 The celebrations in Parrikar's ancestral village would be Goa's way of saying thank you to the Minister for carrying out surgical strikes across the border in Pakistan-occupied Kashmir, he said. "We have ordered a cake for him which is related to defence. Arjuna tanks, Bofors guns and all those things will be part of the cake," Lobo told the media here. The BJP MLA said the birthday celebrations will be held in Parra village, part of Calangute constituency, and clubbed with a Vijay Sankalp rally, part of a series of poll rallies organised by the Bharatiya Janata Party in 39 out of 40 constituencies of the state, ahead of the upcoming assembly elections. "This cake is to showcase (to) the people of India that Manohar-ji has successfully carried out the surgical strikes. This is the love from the people of Goa, from the people of his own village, from the people of Calangute constituency to showcase how important he is and how important his decisions are," Lobo, a legislator from Calangute, said. "This birthday is going to be a remarkable one for him. For the first time in his whole life, he is celebrating (it) in his own constituency. The people are also waiting to see, waiting to hear him... his experience. "All of a sudden he goes to Kashmir, to Andaman and Nicobar islands. He goes to Karwar, he is travelling all over India and other parts of the world to strengthen our defence force," Lobo said. The leader said the cake was a surprise for Parrikar, who wanted a low profile event. "We have not told this to him. It is going to be a surprise. He had told (us) to keep it low profile because he wants to talk to people. He wants to interact with the people. This is what he wants to do tomorrow (Tuesday) here. And he is actually not very much interested in celebrating his birthday," Lobo said.